ArctiClean is a two-step cleaning process that removes existing thermal grease or pads from your heatsink and processor. We are proud to introduce ArctiClean, the first retail product to emerge from the union of Arctic Silver and Nanotherm technology. ArctiClean is a two-step cleaning process that removes existing thermal grease or pads from your heatsink and processor or any other IC, and prepares the thermal surface for a fresh application of thermal interface material. This is an essential approach in order to maximise thermal conductivity between the heat source and the heatsink. 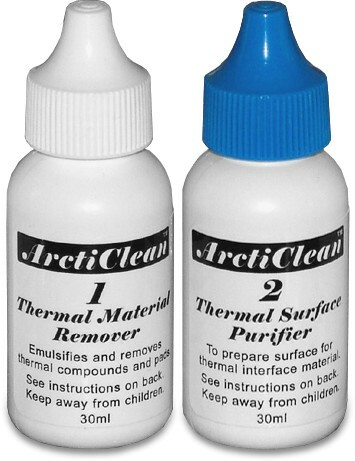 ArctiClean Bottle 1 Thermal Material Remover quickly emulsifies and dissolves the existing thermal grease or pad from the CPU and/or heatsink so that it can easily be removed with a clean cloth or paper towel. Then, a few drops of ArctiClean Bottle 2 Thermal Surface Purifier and some gentle wiping removes the remaining residue and inhibits corrosion on the copper or aluminium surface. ArctiClean 1 uses a proprietary combination of non-toxic biodegradable solvents to emulsify thermal greases or thermal pads. The citrus and soy-based solvents in ArctiClean 1 match or exceed many hazardous and volatile solvents such as fluorinated and chlorinated organic solvents, acetone, MEK (methyl ethyl ketone), mineral spirits, isopropyl alcohol, and toluene. The cationic surfactants in ArctiClean 2 remove any residue left by the ArctiClean 1, leaving a pristine surface for the application of a new thermal interface material. It also incorporates advanced flash corrosion inhibitors that minimise the corrosion layer on copper and aluminium allowing for more intimate contact between the thermal interface material and the heatsink. I'm a noob, never ever re-pasted a chip, after paying a so called pro to fit a new fan I had the worst overheating!!!! Used this to clean the fan and chip which were covered in paste and I mean covered. The Arctic5 paste dropped temp from 54 to 34 on idle, I just followed instructions from youtube lol. A must for anyone changing cooling on CPU or GPU. Excellent product when used correctly as advised. Does what it says on the t.., err, bottles. If you've ever tried cleaning an older CPU or cooler of caked thermal compound without the aid of something like ArctiClean, you'll appreciate that it's both tricky and mucky work. With ArctiClean, life gets a lot easier - the remover dilutes the muck and makes it a joy to remove, easily and quickly. The purifier leaves the surface shiny for the next installation. The containers are well designed to give you controllable drops, easy to apply safely. Does the job. No problems. Works brilliantly - a must have for any thermal paste application! This is a must have for everyone that will be installing a new CPU cooler or just giving the old one a fresh start. Amazing! Never going to leave home without it ... Been building machines for 20+ years and recently discovered this. Excellent product and will use for all future builds/rebuilds. Highly recommended. This stuff is excellent - easy to use, no mess, no fuss, and prepared the thermal surfaces perfectly. Great stuff! After wiping away the excess old thermal grease and pads, Part 1 dissolves what remains in a few seconds. Part 2 removes the very last trace reading the surface for Arctic Silver 5. I use it on every build and re-build I do. If you build a few PCs or are just changing your heatsink this is what you need. I swear by it!